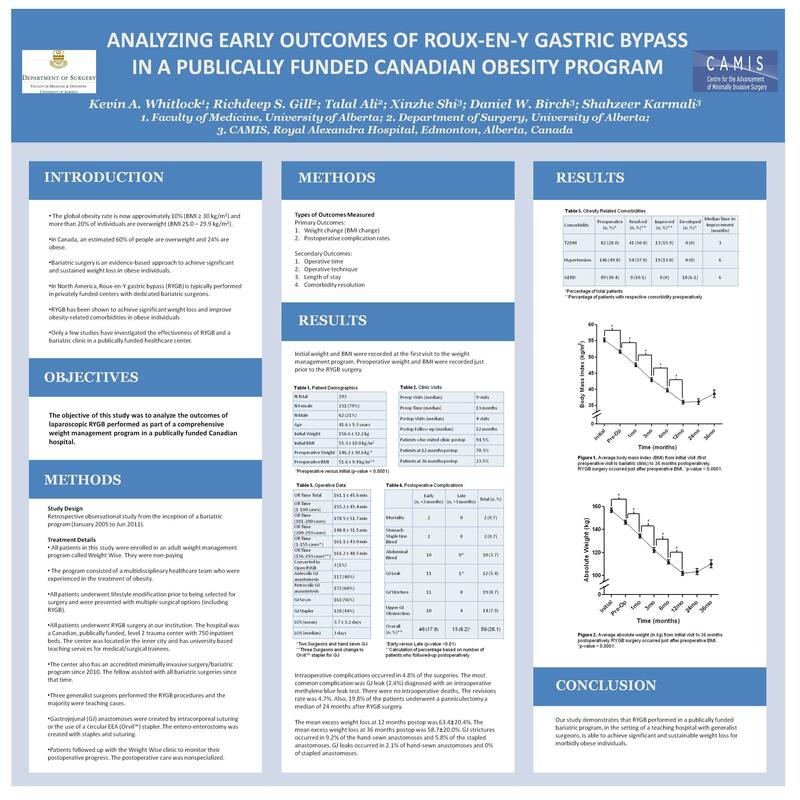 The purpose of this study was to determine the outcomes of laparoscopic roux-en-Y gastric bypass (RYGB) surgery performed since the inception of an obesity program in a publically funded, Canadian teaching hospital. A retrospective study identified 265 patients who underwent laparoscopic RYGB since the inception of a bariatric program (2005 – 2010). The hospital was a publically funded, level 2 trauma center with 678 beds and an advanced minimally invasive surgery (MIS) bariatric program. All patients attempted weight loss with the program before being selected for surgery. A total of three different surgeons performed all procedures and they were not dedicated bariatric surgeons. The average age at surgery was 41.5 years, 81% of the patients were female, and the mean preoperative BMI was 51.8 ± 9.5 kg/m2. The average operative time was 162.7 ± 46.7 min and the majority of surgeries were teaching cases. The median in hospital stay was 3 days and the median postoperative follow-up was 12 months. At 1 year 76% of the patients followed up with the clinic and the average BMI was 36.0 ± 8.6 kg/m2, which was an excess weight loss of 63.5 ± 20.3%. This corresponds to a statistically significant 31.6 ± 8.8% decrease in total weight from preoperative levels and a 35.5% ± 8.6% decrease from their first visit with the program. After 159 surgeries with a hand sewn GJ anastomosis, the surgeons changed to using a circular Orville stapler. There were 9 leaks in hospital (5.7%) and 3 leaks within 6 months of surgery (2.6%) after hand sewing the GJ anastomosis. This is compared to no leaks after using the circular Orville stapler. Additionally within one year of surgery, 13 patients (11.7%) developed GJ anastomotic strictures after hand sewing, in comparison to 5 patients (5.8%) after stapling. The positioning of the roux limb was either retrocolic (159 patients) or antecolic (106 patients). After one year, there were 10 bowel obstructions (6.4%) after retrocolic positioning, in comparison to 2 bowel obstructions (2.3%) after antecolic positioning. Postoperative complications also included gastric staple line bleeds (0.4%) and abdominal hematomas (2.6%). There were 3 (1.1%) postoperative deaths and 18 patients (6.8%) underwent surgical revision. Preoperatively 29.1% of the patients had type 2 diabetes mellitus. Postoperatively, 51.3% had complete resolution and 65.4% had improvement or resolution of their diabetes after a median follow-up of 3 months. Also, 48.9% of the patients had preoperative hypertension. Postoperatively, 37.4% had complete resolution and 50.4% had improvement or resolution of their hypertension after a median follow-up of 6 months. Our obesity program, in a publically funded teaching hospital without dedicated bariatric surgeons, was able to achieve significant weight loss and improve the comorbidities of our morbidly obese patients. Therefore, even in an unconventional setting for an obesity program, we show that bariatric surgery with appropriate follow-up support can be effective for treating obesity.